Etymology: the name " araucaria " is of Indian origin; the nickname "despair of the monkeys" is explained by its leaves sharp scales that prevent its escalation by monkeys. Habitat: the araucaria fears frost. It fits well to the mild climate of the South of France or of west of France. Lifespan: statistics are lacking, but it is said that araucarias can live 1000 years. Shape: of a pyramid. With age, the araucaria loses its low branches, as in most conifers. Its shape becomes tabular or in bowl. Grey, wrinkled bark, marked with annuluses left by the scars of the thrown branches. Persistent leaves, in sharp scales. 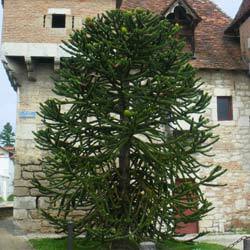 Araucaria is a species dioecious (male and female flowers on separated subjects). Flowers are born in tip of stems: males are impressive bowls, 10 cm, which liberate their pollen in July. Females are upright cones of 15 cm. Fruits mature in late autumn. Seeds are eaten as a dessert in Latin America. The botanist Menziès, at the end of the XVIIIth century, took profit of a dinner where araucaria seeds were served to take a sample of it and to introduce the species into the north hemisphere. Araucaria bidwillii, native to Australia. Araucaria angustifolia or Tree candelabrum ("Angustifolia" = "with narrow leaves"), native to South America. It is a small tree with leaves in tight scales. Araucaria of Cook, Araucaria columnaris with form narrow columnar. Pine of Norfolk, Araucaria heterophylla ("with various leaves"). It is native to the island of Norfolk, north of New Zealand (wich is the emblem).